Is it really already Monday? I feel like I blink and the weekend is over. I am prepping myself for a crazy week at school as it is the week before Halloween, and my first grader’s have been counting down the days until the 31st. I guess I should feel ecstatic that Halloween falls on a Saturday this year and not mid-week, which always makes for a class full of sugar-filled kiddos all week long. When I received this top from PB&J Boutique, I fell in love. The bright, ornate details at the top really make this little number a fun piece to wear. 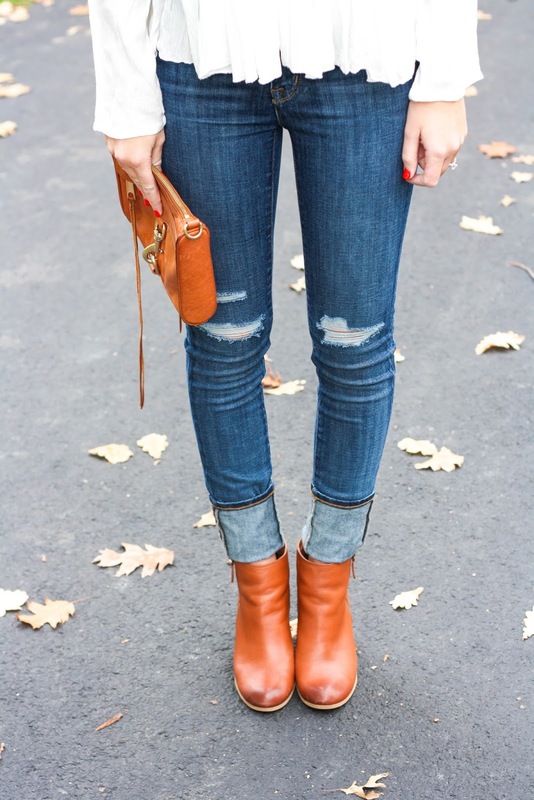 I decided to style it simply with jeans, cognac accessories and a floppy hat (of course! ), for a day of running errands. This piece could definitely be styled up or down and I have even thought about wearing it for Halloween in a Day of the Dead costume. Either way, it’s definitely a fun piece to have in my wardrobe, and with the bright colors, something I will be wearing year round! This look is so so pretty!!! Such an adorable tunic and I'm loving the floppy hat! I have these booties in gray and now I am thinking that I need them in this cognac color immediately. I am going to order a pair of DSTLD jeans but wanted an opinion on sizing. Do you think they are true to size? And one more question – what wash are the ones you're wearing? Thanks for your help! In love with this top! It's so cute! Oh my goodness, that top is too cute! Enjoy Halloween with your kiddos! Oh my goodness! I absolutely love that top and your shoes. Seriously so adorable! You are so gorgeous! Seriously I adore that top, soo soo much fun! This is SO cool!! I love the sleeve details! How fun are those tassels!? You look so perfect! And those fall leaves make me so jealous.. send me some! I love you top! It's so bright and memorable. Your shirt is absolutely stunning. You look incredible and perfect for fall! That is the most adorable top! Love, love this look. Is it weird that your top totally reminds me of a fiesta? Either way I'm in love with your look – how stinkin' cute! How fun is that shirt, I love it! This is a good look on you! I adore your top. That top is SO fun! I love how detailed the embroidery is, and you paired it with the perfect colored accessories! I'm so so so so so so in love with this outfit! You look so great!